That’s why I thought I’d share these instructions. They’ve always worked for me. First, put the eggs in a pot. I don’t know what kind of pot, I just call it a pot. I use this one in the picture. You won’t need a lid. And from my experiments, you can put as many eggs in as the pot will hold (without stacking), it won’t change the formula. Fill the pot up about half full, until there’s enough water to cover the eggs plus another inch or so. Turn the burner on almost all the way (but not all the way) to High. I put it at about 8. Once the water starts boiling start the clock. You’re looking for a medium boil, not crazy high. 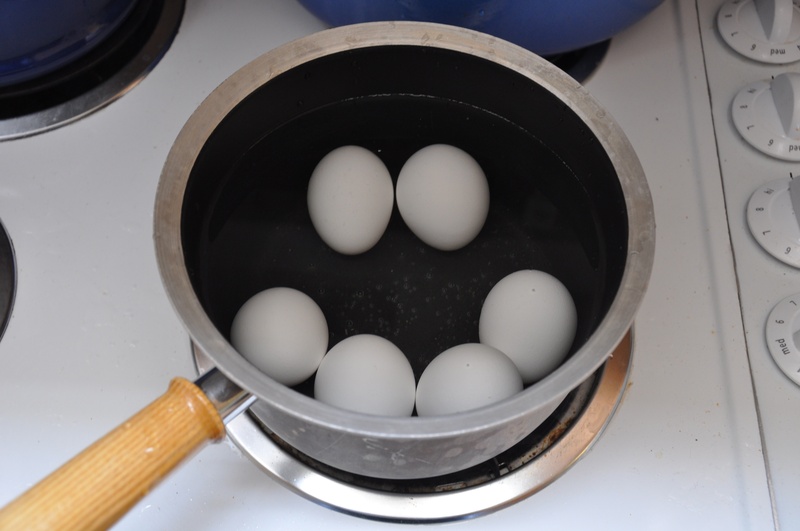 Let the eggs boil for exactly 10 minutes. Remove from heat. Drain. And cover with cold water. Done. Now devil those pretty little angels.